I made the transition from a Blackberry to an Android last August. Going in, my heart was set on the HTC Evo, but the Sprint salesperson highly recommended the Samsung Epic 4G. After playing with it and reading trusted reviews, I left the store a proud Epic owner. The most appealing features of the phone were its dynamic colors, slide out keyboard, 720p video recorder, and quick processor. Seriously, my Blackberry Curve could never keep up. Although, it didn't take long before I realized how little time the battery afforded me in between charges. By weeks end, I found myself looking for a power source in every place I went. For the record, there are no power plug-ins at any theater in Smithfield. By January 2011, I was accustomed to living with my wireless phone's umbilical cord. It was a necessity. However, what I couldn't live with was the noticeable speaker issue. Sometime in December, the Epic's external speaker blew. To the best of my knowledge, I had done nothing out of the ordinary. In fact, I barely used the speaker phone at all. Unfortunately, the sound got so bad that I started missing telephone calls. Eventually, I took it back to Sprint for a once over. Within minutes, the technicians informed me that they would order a replacement phone for free. Thank you, insurance policy! Days later, my phone arrived. I traded my old phone for its successor and was out the door within the hour. All was well until the speaker problem reared its ugly head again. Silently, I asked myself if this was the same phone. Was it something I did? Is this a known issue with the Epic? My friend Louis Gray, who is also an owner of the Samsung Epic, responded to the question by saying he hadn't heard of the problem before this incident. What are the odds that I would have two phones with the same issue? Needless to say, I went back weeks later and requested another replacement phone. This now makes the third phone in less than a year. Almost immediately after receiving the third phone, I had another problem. No, the speaker worked GREAT! This time, the phone randomly shut down for no apparent reason. If I allowed the phone to auto-sync accounts, it would shut down. With auto-sync off, it still shuts down, just less frequent. I thought a software update would solve the problem, so I waited until Froyo (Android 2.2) came out and installed it on the phone. Not long after it finished installing, the phone locked up and shut down. Sometimes, it doesn't shut down at all. Instead, it merely locks up, goes black, and beeps. Talk about frustrating! This past week, I go back to the Sprint store and explain my dilemma. The technicians inform me that a hard reset should do the trick. If not, I'll need another replacement phone. Aware of the options, I allow the Sprint experts to once again wipe the phone clean and start over. Just so you know, every time they wipe the phone, I have to download my favorite apps and customize the phone for personal use. Within an hour after a hard reset, the phone acts up again. I guess this means that I'm taking it back for my 4th phone this year. So, let me ask the question, "Is the problem with the Samsung Epic or is it with Sprint?" My first observation is that the only NEW phone I ever received was the first one. The original phone came with a box, instructions, and all the accessories. Every phone after the first came solo. This leads me to believe, I'm getting a refurbished phone. Most likely, the phone was broke, the company "fixed it," and redistributed it to people like me. If that is the case, then maybe Sprint should rethink their technicians' ability to fix what is broken. I assume it's cheaper than handing out new phones to everyone, but at what point does this refurbishing program no longer work? Personally, I'm growing skeptical of Sprint's ability to fix stuff. 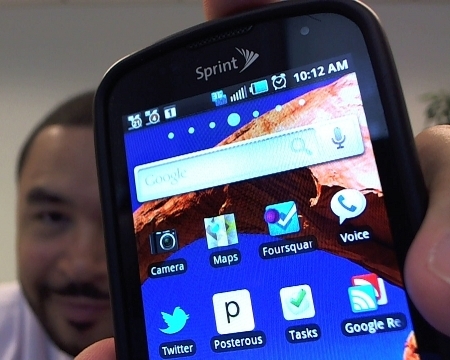 With that written, let me assume that Sprint is doing all it can and the problem rests with Samsung's device. None of my friends with an HTC Evo are having mechanical issues. Do I leave Samsung alone and go with an Evo? At this point, I just want my phone to work. Unfortunately, I'm not sure if I should blame Sprint or Samsung for my less than perfect experience. What do you think? Are you having similar issues? Should I ask for a NEW phone, accept another replacement, or just leave the Epic alone for good? Whatever your thoughts, I'd love to hear about them in the comment section below. How Long Does The Samsung Epic 4G Extended Battery Last?